Neville Wyatt, Major Lord Newbury, was on a peaceful reconnaissance mission in Portugal during the Napoleonic Wars when a sniper killed his sergeant. Neville married the sergeant’s daughter to protect her in case of further ambush, but when the ambush came, he saw Lily killed just before he was severely wounded in the head. Now, almost two years later, Neville is back home, having inherited his father’s title of Earl of Kilbourne, and he is about to marry his cousin-by-marriage, Lauren Edgeworth, who has lived with his family since infancy. Lily, however, did not die. And now she has found her way back to England and back to Neville. 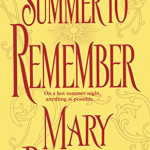 Note that Lauren Edgeworth’s story is told in A Summer to Remember, which introduces the Bedwyn family and leads to the six-part Slightly series and the four-part Simply series. Gwen, Lady Muir, Neville’s sister, has her story told in The Proposal, which is also the first book in the seven-part Survivors’ Club series. 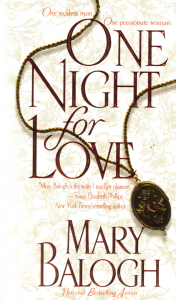 Bestselling author Balogh bursts the bounds of genre in this emotionally complex Regency. A passionate novel with mature, compelling characters who struggle for self-knowledge and for the survival of their loves, this is one of Balogh’s best. Lily arrives at Newbury Abbey one evening to find a grand party in progress. She is turned away at the doors and is forced to spend the night on a beach nearby. When Lily awoke early the following morning, she washed her face and hands in the cold water of the stream and tidied herself as best she could before climbing the path back up over the fern-draped slope and through the trees to the bottom of the cultivated lawn. She stood looking up at what appeared to be stables with the house beyond. Both looked even more massive and forbidding in the morning light than they had appeared last night. And there was a great deal of activity going on. There were numerous carriages on the driveway close to the stables, and grooms and coachmen bustled about everywhere. Last night’s party guests must have stayed overnight and were preparing to leave, Lily guessed. It was clearly still not the right time to make her call. She must wait until later. She was hungry, she discovered after she had returned to the beach, and decided to fill in some time by walking into the village, where perhaps he could buy a small loaf of bread. But when she arrived there, she found that it was by no means the quiet, deserted place it had been the evening before. The square was almost surrounded by grand carriages—perhaps some of the very ones she had seen earlier by the stables of the abbey. The green itself was crowded with people. The doors of the inn were wide open, and a great bustling in and out discouraged Lily from approaching. She could see that the gateway to the church was tightly packed with an even denser throng than the green held. “What is happening?” she asked a couple of women who stood on the edge of the green close to the inn, both staring in the direction of the church, one of them on tiptoe. They turned their heads to stare at her. One looked her up and down, recognized her as a stranger, and frowned. The other was more friendly. The Earl of Kilbourne! Again the name sounded like that of a stranger. But he was not a stranger. And the meaning of what the woman had just said struck home. He was getting married? Now? Inside that church? The Earl of Kilbourne was getting married? But Lily did not wait for further explanations. She was hurrying across the green, threading her way among the people standing there. She was half running by the time she reached the church gateway. Neville could tell by the flurry of movement at the back of the church that Lauren had arrived with Baron Galton, her grandfather. There was a stirring of heightened expectation from the pews, which held all the flower of the ton as well as number of the more prominent local families. Several heads turned to look back, though there was nothing to see yet. Neville felt as if someone had tightened his cravat at the neck and dropped a handful of frisky butterflies into his stomach, both of which afflictions had been with him to varying degrees since before the early breakfast he had been unable to consume, but he turned eagerly enough for his first sight of his bride. He caught a glimpse of Gwen, who was stooping apparently to straighten the train of Lauren’s gown. The bride herself stood tantalizingly just out of sight. The vicar, splendidly robed for the occasion, stood just behind Neville’s shoulder. Joseph Fawcitt, Marquess of Attingsborough, the male cousin closest to him in age and always a close friend, cleared his throat from his other side. Every head, Neville was aware, had turned now to look toward the back entrance in expectation of the appearance of the bride. Of what importance was a mere bridegroom, after all, when the bride was about to appear? Lauren was exactly on time, he guessed with a private half smile, It would be unlike her to be late by even a single minute. And then she stepped through the doorway into the view of those gathered inside the church. Except that she was alone. And not dressed as a bride but as a beggar woman. And she was not Lauren. She took a few hurried steps forward along the nave before stopping. It was a hallucination brought on by the occasion, some remote part of his mind told Neville. She looked startlingly, achingly familiar. But she was not Lauren. His vision darkened about the edges and sharpened down the center. He looked along the nave of the church as down a long tunnel—or as through the eyepiece of a telescope—at the illusion standing there. His mind refused to function normally. Someone—two men actually, he observed almost dispassionately—grabbed her arms and would have dragged her back out of sight. But the sudden terror that she would disappear, never to be seen again, released him from the paralysis that had held him in its grip. He held up one staying arm. He did not hear himself speak, but everyone turned sharply to look at him and he was aware of the echo of someone’s voice saying something. “Lily?” he whispered. He tried to restore reality and passed a hand swiftly over his eyes, but she was still there, a man holding to each of her arms and looking his way as if for instructions. There was a coldness in his head, in his nostrils. “Lily?” he said again, louder this time. He was still seeing her down the tunnel of his hallucination. Only her. Only Lily. He was unaware of the church, unaware of the people stirring uneasily in the pews, of the vicar clearing his throat, of Joseph setting a hand on his sleeve, of Lauren standing in the doorway behind Lily, her eyes wide with the dawning premonition of disaster. He clung to the vision. He would not let it go. Not again. He would not let her go again. He took another step forward. The vicar cleared his throat once more and Neville finally comprehended that he was in All Souls Church, Upper Newbury, on his wedding day. With Lily standing in the aisle between him and his bride. The silence, though total, lasted only a very few seconds. “My lord?” The vicar was the first to break it. There was a swell of sound as half the people present, it seemed, tried to talk at once while the other half tried just as loudly to shush them so that they would not miss anything of significance. The Countess of Kilbourne was on her feet in the front pew. Her brother, the Duke of Anburey, rose too and set a hand on her arm. But no one paid his grace any heed, except the vicar. Everyone had heard what Neville had said. There had been no ambiguity in his words. Everyone knew that for over a month before his return to England Neville had lain in a hospital in Lisbon, suffering from a head wound sustained during an ambush among the hills of central Portugal when he had been leading a winter scouting party. Amnesia and persistent dizziness and headaches had prevented his return to his regiment even after the wound itself had healed. And then news of his father’s death had reached him and brought him home. But no one had heard of any marriage. And clearly the woman he had married was not dead. Someone in the church had already realized the full implications of the fact. There was a strangled cry from the back of the church, and those who looked back saw Lauren standing there, her face as pale now as the veil that covered it, her hands clawing at the sides of her gown and sweeping up the train behind her before she turned and fled, followed closely by Gwendoline. The church doors opened and then closed again rather noisily. “Neville!” Lady Kilbourne was clinging with both gloved hands to the back of the pew. But Neville held up both hands, palm out. He lowered his arms and strode down the aisle, his right hand reaching out toward Lily. His eyes were on hers. His hand closed on hers and clamped hard about it. He scarcely broke stride, but continue on his way toward the outer door, Lily at his side. Neville threw the doors wide, and they stepped out into blinding sunshine and were met by a sea of faces and a chorus of excited, curious voices. He ignored them. Indeed, he did not even see or hear them. He strode down the churchyard path, through the gateway, between crowds of people who opened a way for him by hastily stepping back upon one another, and around to the gates into the park of Newbury Abbey. He said nothing to the woman at his side. He could not yet trust the reality of what had happened, of what was happening, even though he held tightly to the apparition and could feel her small hand in his own.